In today's troubling economic times, the quality of our retirement depends upon our own portfolio management. But for most of us, investing can be stressful and confusing, especially when supposedly expert predictions fail. Enter The 3% Signal. Simple and effective, Kelly's plan can be applied to any type of account, including 401(k)s -- and requires only fifteen minutes of strategizing per quarter. No stress. No noise. No confusion. If you ask any reasonable person who invests in the stock market about goals, the general one given is to "buy low, sell high". Yet, many people end up doing the exact opposite. Why? Is there any way to change that? Jason Kelly opines that trying to predict the market is a fool's game. There are lots of pundits giving out lots of information (or at least making lots of noise), but the reality is no one knows when the stock market will fall next, or how far, we only know that it will fall one day, and that eventually, it will grow beyond where it is now. In other words, the general trajectory of the market is up, but there are plenty of downs along the way. All too often people follow the crowd--everyone gets afraid of falling stock prices, so "everyone" sells, and stock prices continue to fall, so the sellers lock in their losses. Then the real winners step in; those who buy at low prices. How can we be in that number? 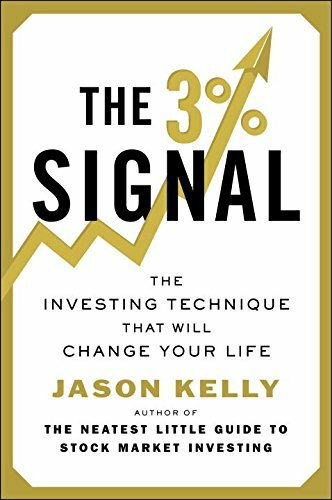 This book by Jason Kelly describes and defends his system for buying low and selling high. Using historical data and just general numbers, he shows why the system works and the advantages of using it. In short, as you can see on his website (so I'm not telling secrets) Kelly advocates an 80/20 stock/bond allocation for most investors, and advocates using two mutual funds to implement his system. Every quarter that the stock portion of the portfolio grows by more than 3%, Kelly advocates selling shares in the stock fund and putting them into the bond fund such that you only keep the 3% gain in stocks, the rest is converted to bonds. If, at the end of a quarter, your stock fund has not gained 3%, you use the money in the bond fund to buy more stock so that there is a 3% increase in the value of the fund. The only hitch in the system is that if the value of the stock fund falls far enough, in order to get full value from the system, you may have to put outside money into it. However, even without the outside money, the system in and of itself, with its discipline of only looking at the gains/losses quarterly and with its determined path of acting on what has clearly happened, will grant you superior returns over the long term. While you won't beat "Peter Perfect", you'll beat most investors. So, why does it take a whole book to talk about a system I described in a paragraph? Kelly leads readers through probability exercises to show why the system works. He talks about why predicting the market is so hard, and, in the end, it is so useless to try. He recommends mutual funds that are appropriate to use in the plan and advises how to put the plan into action. He even carries you through the life of the plan. The system sounds good to me and I wanted to try it with my 401(k). My husband did not like the idea of that much money in a small cap stock fund. The compromise is that I am going to stick with the funds I have but use the 3% rule with each. Earlier this month I wrote about Kickfurther, a company that allows ordinary investors to lend money to small companies seeking to grow their businesses. Companies apply for loans, and if they make it through Kickfurther's underwriting process, Kickfurther puts the loan up on its website so investors can purchase shares of it. Once the loan is fully subscribed, Kickfurther takes the money, collects a certain portion as their fee and then purchases the goods the company wants to sell. The picture above is deodorant. North Coast Organics had to opportunity to sell to TJ Maxx but needed money to finance the inventory. They requested over $7,000 and offered an 8% return. Well, they got paid for the deodorant so those of us who invested got our money back today, plus 8% interest. They had my money for two and a half months. Since my $50.00 (plus $4.00) was back in my account, and another company was looking for money, I signed up. You use this stuff for screen printing, a process I won't pretend I understand. This company will pay 10% after six months. They promised a payback of 11% after six months. I invested $50, and so far they've paid me back $8.07. They are supposed to make another payment in four days. So far, Kickfurther is looking like a winner for me. A few more good payoffs, and no losses would convince me to put some real money into this. Right now, the problem I see with the site is a lack of borrowers. The last three offers I've seen were all funded within hours. Right now, if I wanted to invest in something, there is nothing available. Social Security: Why the 8% "Return" Myth Shouldn't Make You Wait to Retire I keep reading about what a great idea it is to delay taking Social Security as long as you can, because the amount you get per year grows every year you choose not to take it. From what I've read, I agree, taking Social Security at 63, if you are still collecting enough of a paycheck to survive, is probably not a good idea. However, once you pass full retirement age and Social Security no longer witholds part of your check if you have other earnings, the math gets much more interesting, and this article explains why. The 'Safety First' Guide to Retirement Withdrawals Unless you have a pension that meets your living expenses, spending during retirement is a balancing act between enjoying the lifestyle for which you've saved, and making sure there is enough money to support you for your entire life. This post goes beyond the "4% rule" to talk about planning your spending. Peer to Peer Lending Sites Review #1- Full Disclosure This article is written from the borrower's point of view rather than the investor's but it still gives a good rundown on the various sites. A Better Way to Tap Your Retirement Savings Another alternative to the 4% rule. Is Retirement Overrated? You May Be Surprised By the Answer I hope it isn't overrated! 9 Safe Investments That Aren't Bonds Lending Club is one choice. In my head, when I'm being reasonable and logical, I really believe the best long-term strategy for wealth-building for those of us who do not own our own business is to buy into lots of other people's businesses via a diversified portfolio of mutal funds. I back up that belief by investing most of my money that way. However, there is that part of me that likes to play with money, that likes to try new things and to try to beat the system. For some reason I've always wanted to own individual shares of stock in companies but I've never been willing to put all my eggs in one basket, and putting eggs in lots of baskets, unless you do it via mutual funds (and to some exent even then) means lots of fees. The internet is changing that. Today there are several different ways ordinary people can invest directly in stocks without paying huge transaction fees. One is Motif Investing., which, if you invest via the links in this article, will give you and me both $100.00. The concept behind Motif Investing is simple. Investors buy a "Motif" a basket of up to stocks that represent some idea, concept, sector or whim of a developer. Motif investing offers not only motifs created by professional staff but also those created by customers, ordinary people like you and me. If someone chooses to buy a motif I create, I get a commission. How cool is that? It is like I am a mutual fund manager! Investors pay one commission per motif purchase--$9.95, whether they invest $200 or $200,000. The purchase can include fractional shares. Also, many weeks there is a Motif of the Week, and if you choose to purchase it, there is no sales commission. I've been reading a lot about investing in high-dividend stocks as a retirement income source and one week a motif named "High Yield Dividends" was the Motif of the Week. I decided to make it my first purchase. I now own shares of twenty-five different companies including Southern Company, AT&T, Verizon, Darden's Restaurants and McDonalds. I also developed my own motif, based simply on companies from which I like to buy, including Ascena Retail Group (owns Dress Barn, my favorite place to buy clothes) and Lending Club (ok, I don't buy from them but I invest with them). So far, Yum Brands and Panera Bread are leading the pack and beating the market. Chipotele isn't doing so well. Such is life. Another week, the Motif of the Week was named Buyback Leaders and it was made of stock in companies which have bought back shares of their stock. Some stocks in the motif are Dr. Pepper Snapple Group, Inc., Anthem Inc. and Gap, Inc. I'll be the first to admit that I know little about market capitalization, PE ratios, market cycles or any of those other technical terms that are supposed to define the best times to buy and sell stocks. Corporate annual reports make my eyes glaze over. I do not think I should be investing large amounts of money in stocks based on my "it looks interesting" criteria but so far the motifs in which I have invested have about tracked the market which I guess means I'm not so dumb after all. Given the low fees involved in Motif Investing, I think it bears a look by anyone wanting to manage his or her own investments. The links to Motif Investing in this article are affilliate links. Use them to open your account and when you purchase your first Motif, we will both receive $100.00. My parents were financially successful. They had some good luck and they made some good luck, and in the end were able to not only have a comfortable old age but were able to leave a substantial inheritance to their five children. While it is more money that I have ever gotten in one transaction, it will not be enough, in and of itself, to support us in our old age. So, what did we do with all that money? I got the first installment of my inheritance in June, and it was close to six months of take-home pay for me. At the end of June we are allowed to change our 401(k) contributions and I changed mine to eliminate take-home pay, so in essence, that first installment of my inheritance went into my 401(k). I was able to live off my non-taxable inheritance, and turn my paycheck into tax-deferred retirement money. When the big check came in February, I put about 10% of it in marketplace or peer-to-peer lending, split between Lending Club and Prosper. I have been investing with Lending Club for almost eight months now and I've been very happy with the returns. Using XIRR, which is generally considered to be the most accurate way of computing returns with this investment, my returns are over eight percent. One thing that can be an advantage or disadvantage to this investment is that it turns over a substantial amount of money ever month. Looking at a random loan in my portfolio, I see that it has a monthly payment of $.62 on a $25 investment. The first couple of months, $.36 is interest and $.26 is return of principle, so don't confuse payout with return, but the fact of the matter is that between my accounts at Lending Club and Prosper, if I choose not to reinvest my returns, I can withdraw close to my entire paycheck per month until some of the loans start to be paid off. While it is not the instant liquidity of a bank account, it gives me access to some of my money without having to put assets up for sale--but if I do want to sell and cash out early, there is a secondary market for the loans. Depending on the costs of our other goals, we may add more money to this asset class. I've always wanted to invest directly in the stock market, to pick my own stocks and to watch them (hopefully) grow and make me money. My husband and I bought stock in Novellus quite a few years ago, watched it almost triple in price, and then we sold it when it had dropped to twice what we paid for it. If only... Honestly, I know mutual fund managers get paid big bucks to pick winners and few do better than the market as a whole. That's why I can't justify the costs or risks of putting a lot of money into individual stocks. However, there is a new player in the industry, Motif Investments. Using a web interface, clients selected a basket of up to thirty stocks to purchase at one time. You can pick a basket (Motif) that they designed, one that a fellow investor designed or one that you design yourself. There is one $9.95 charge to purchase as much of the motif as you want. While this is an investment on which I hope to earn money, at this time I am only investing about $5,000 and I'm considering it to be a toy. If I'm really successful, I may reconsider. I haven't picked anything to buy yet. Our Roth IRAs are with Vanguard and we maxed them out for 2014 and plan to use the inheritance to max them out in 2015 and 2016. Right now, all the money is in their 500 Index Fund. We are probably going to move future contributions to a dividend-centric index fund. Our house is forty years old. We've lived here for twenty and raised 2.5 kids (one is ten years old). While we renovated the kitchen fifteen years ago, the rest of the house needs new floors, new paint and general freshening. We plan to renovate both bathrooms with new tub surrounds, new vanities and new floors. Hopefully the budget I have in mind will work; if not, we'll need to make some choices. As mentioned in other post, our financial advisor has us in a portfolio of many mutual funds. We bought them all at one time, and since that time the market has gone down and not returned to that point. We realize that part of the reason our 401(k)s look good next to these accounts is because funds are added regularly. Therefore, we are going to invest about ten percent of the inheritance with our advisor, in two or three different chunks. Hopefully it works for us. We know we are looking at getting my daughter a car (used) when she graduates from college unless she does as she has said she wants to, and moves to New York City. We know my husband is driving an old car. We know my youngest will likely end up in a Catholic high school where tuition is approaching $10,000 per year. We are going to keep the rest of my inheritance in the bank to help us handle these expenses when they get here. What did you do with your inheritance? Have you ever contributed to a Kickstarter campaign? For those not familiar with Kickstarter, it is a crowd-funding source for new business ideas or products. Entrepreneurs pitch their products at Kickstarter and through social media, hoping to garner enough funding to begin production or carry out a plan. For example, a family friend who played in a band was diagnosed with a brain tumor and, in the days before his surgery. recorded some of his music. Unfortunately, he did not survive the surgery. His band wanted to record an album that included his music and to produce cds with that music so his family and the band promoted a Kickstarter campaign to fund the production costs. Those of us who invested received a copy of the cd and other band swag, depending on the amount of our investment. Since the cd and swag were our only expected return on investment, I'd say this was as much a gift as an investment, but if you peruse the Kickstarter site, you'll see that investors can end up with gifts worth as much as their investment, if not more. Nevertheless, I'd consider money used at Kickstarter to be fun money, not really an investment. If I'm talking about Kickstarter, why is the post titled "Kickfurther.com"? Because Kickfurther is another site, and it takes these new businesses a little further than Kickstarter does. Isn't that a cute swimsuit? I wish I could wear it. The manufacturer, AMARA, is relatively new and needs capital to produce a line while also spending money on advertising and marketing. They want to borrow $6839.00 for six months, and will return $1.10 per dollar invested. Sounds like a great payoff, but I realize that with that kind of reward goes risk. I invested, but only $50.00. If I lose, I won't lose much. While my percentage of return is high, the actual dollar value, due to my low investment, isn't very substantial. Unless enough people invest to fund the entire loan, the transaction is cancelled. Kickfurther gets a security interest in the inventory so they can liquidate it if the manufacturer fails to sell it. Once half the inventory is sold, the lenders get their money. Of course if they can't sell the inventory and don't get enough for it to pay back the loan, I lose money. Another downside is that there is a 1.5% withdrawal fee when I get ready to take my money home--but they do let me continue to reinvest without paying the fee. So, is Kickfurther a toy, or is a serious investing opportunity? Right now, for me, it is a toy. If there were a hundred choices, investing a little in each would be an attractive investmeny to me, but right now, they have only three companies looking for money, thirty-one with outstanding loans and six have been completely repaid their loans. While there are protections in place for investors, the reality is that it won't take many bad loans to wipe out my profit, or even my investment. The platform is trying to grow and I plan to keep it on my radar as a place to invest fun money, but until it is larger or has more of a track record, I do not consider it part of my serious investments. What are some other business to whom I've lent money through Kickfurther? North Coast Organics makes natural deodorants. The money I lent them was charged to my credit card in April and they are supposed to pay back $1.08 per dollar lent by the end of August. Below is a Humanoid Wake Boot. Assuming they sell 43 of the 100 pairs I helped buy, I'll get $1.08 in August for every $1.00 I lent them in April. My husband hates to wear a tie, but some folks love them Skinny Ties makes these, and they have slightly (or not so slightly) suggestive names. If they sell 60% of what I helped them buy, then I get $1.20 for every $1.00 invested. They got my money in May and plan to pay it back by November. If Clarisea sells 38% of their supply of this cleanser, I get $1.08 per dollar invested. They got my money in June and plan to pay it back in September. Aren't these pretty? You can buy them at Marlie Madison which is a Texas boutique which is on its third Kickfurther campaign. They borrowed to open a new store and plan to re-pay $1.11 for every dollar borrowed, and to do so over several payments. The charge hit my credit card in April and I just received my first payment of a little more than $0.16/$1.00. Besides lending money to the businesses, Kickfurther gives you to opportunity to make money by selling products financed through the platform, whether you invested in them or not. Here is my store. Feel free to buy from it so I can get a 5% commission. Those tweezers look nice. Does this look like an investing opportunity to you? If you click my affiliate links (including the word Kickfurther throughout this post) and invest, you get a $5.00 credit and I get entered into a contest to earn bigger prizes. One thing many of us would like to do in retirement is to give money to charity, including our churches. Another thing many of us would like to do is to avoid paying taxes. IRA Qualified Charitable Distributions can help you do both. One you reach 70.5 years of age, the law requires you to take (and pay taxes on) a certain portion of your IRA accounts. One way around that requirement is to have the distribution sent directly to a qualified charity. By way of example, if your goal was to donate $2400 this year to your church, and your minimum required distribution was that amount or more, you would tell the custodian of the IRA to send the $2400 directly to the church. If you itemize your deductions, there may or may not be an advantage to this, since charitable donations are deductible, but if you take the standard deduction, this technique allows you to not add this money to your income. Unfortunately, this technique cannot be used by younger people who have inherited IRAs from which they are taking minimum required distributions. Ask your tax advisor if this is a good idea for you, or run the numbers yourself. The IRS rules are here. While it says it is only valid through 2014, to me it has the looks of something that is haggled over and then renewed yearly. One day when surfing the web, I happened on to a new type of investment, "peer-to-peer" or "marketplace" lending. Basically it is a loan product where lenders (investors) lend money to borrowers through an intermediary company that did the underwriting and collecting. Average returns near eight percent were promised. Surely, that couldn't be right. Surely there had to be something funny going on. Surely it was like those multi-level marketing schemes were a few did get rich, but most people didn't. It couldn't be as good as it seemed, could it? This chart summarizes Peer-to-Peer lender, Lending Club's claims about investor returns. In short, as long as you have more than 100 notes ($2500 invested, if you buy new notes) your chances of actually losing money (as long as current trends in repayment continue) is very low. This chart shows that the more money you have invested with Lending Club, the harder it is to stray very far from the norm of about 8%. You can see both of these charts, along with other information, at Lending Club's website. This definitely caught my eye and I headed over to Google to do some more research. I learned that the concept was pioneered by Lending Club's main competitor, Prosper. The product both offer is unsecured personal loans to people considered to be reasonably good credit risks--in other words they are doing what banks have been doing for years via credit cards. As my brother, the used car salesman said "I can make money lending money to any type of person; I just need to price it correctly". Unfortunately, Prosper's first model was that lenders bid on loans and since the lenders were amateurs, they did not price the product correctly and most lost money. One interesting thing about both Prosper and Lending Club is that they allow interested parties to download their historical databases so they can analyze the data and learn what they can from it. Nickle Steamroller is a website that hooks into that data and then allows you to filter it to determine the historical performance of loans of various characteristics. Overall, the rates of return shown there do not appear to be close to 8%, but playing with back testing filters, it does not seem impossible to get good returns, especially compared to what the bank is paying. One thing I did note was that returns have gotten progressively better and that when you look at the three year loans issued in 2010 and 2011, the return on investment (interest, minus fees, minus charge-offs) was close to 6%. We decided to put some of our money into Lending Club to see how it worked. You can read about my experiences on my other blog, though I will be writing more here later. In short, so far I've been happy with my investment and, while I do not claim any real expertise in financial matters, I encourage you to research peer-to-peer lending to see if it is the right place for some of your money.